The weather in Sacramento started turning cooler. Jack and I did some shingle repair on Ellen's roof in the morning. 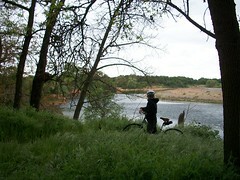 We rode about 12 miles on the American River Trail. It is a great trail, and on a Spring Saturday well used by serious cyclers and casual bikers like ourselves. In the evening we had dinner in Old Sacramento before Esther and I headed for home at 8pm. We made it as far as Medford at 1am where we checked in at the local Walmart. Sunday we drove through Oregon and arrived home in time to unpack and rewind before hitting work tomorrow. It was a great trip and we really enjoyed vacationing with Jack and Sue and spending time with Ellen.